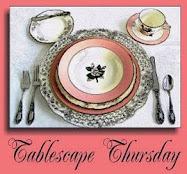 It's time for another Tablescape Thursday, with Susan of Between Naps on the Porch. Alas, I don't have a tablescape for you today! I've been a bit under the weather (probably just seasonal allergies), and I've been busy posting tours for the past four days of historic homes and public buildings in Bolivar, Tennessee. Just so you don't forget me ... or think I forgot about my tablescaping friends, I'm doing a mini ... very mini-post. The picture below is from a party I attended recently. The hostess has a VAST collection of Mackenzie-Childs .... everything! 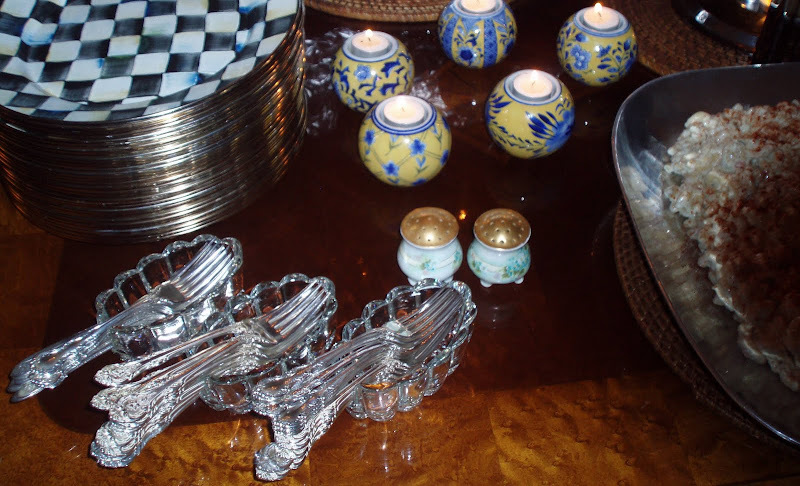 At the start of the buffet line, she had a stack of enamelware "Courtly Check" chargers/plates and assorted sterling forks in crystal caddies. She also used real napkins ... damask ones. None of that plastic plate/plastic fork/paper napkin business for her! 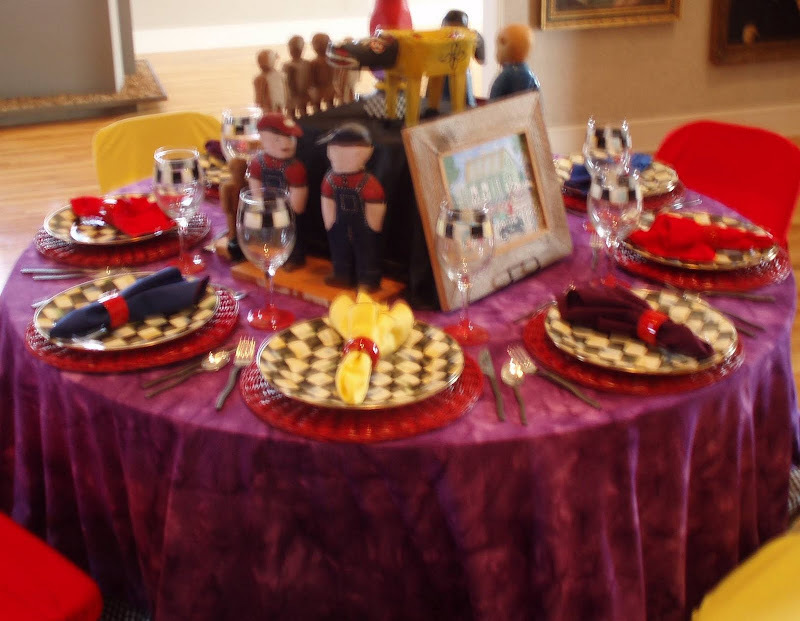 Below (in a TERRIBLE blurry photograph ... the only one I have of it) is the first tablescape in which I ever had a hand. It was done "by committee," so my only real input was helping select the folk art, borrowing the chargers from my friend, and painting Dollar Tree wine glasses to mimic the "Courtly Check" style. I hope MC doesn't mind --- it was for a charity event. I used the paint I had handy: Golden artists colors, thinned with glazing medium. I was certain it wouldn't last, but they only had to make it through one luncheon as water glasses. I painted the bottoms of the glasses red to match the round rattan placemats. I used masking tape to create straight edges above and below the check-patterned band. Then I painted irregularly-sized "squares" (shading the black and white with other colors and blending slightly). I avoided areas where hands and lips would touch the glass in hopes the paint would stay on ... just long enough! 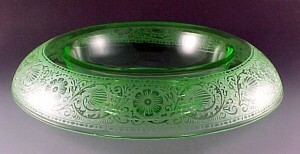 The glasses were given to the lender of the plates. I assured her that they would be "for display only." Well, she used them for a dinner party! One of the glasses accidentally went into the dishwasher ... and survived! Who knew??? Next week .... a real tablescape post ... I promise! I hope you get to feeling better. I've also had the sniffles, scratchy throat, red/swollen/itchy/watery eyes, sneezing a zillion times a day. Fun times....NOT! Sorry you are not feeling well. I just love that black and white check stuff! One of my favs. What a great idea for the glasses. Now you can buy sealer...and you wouldn't have to worry about it not lasting!! Even when you are sick, you come through! I like it! Feel better soon! Ah Mackenzie Childs...I used to love their work sooo much! The more whimsy, the better. Very nice. I hope you feel better soon, Bill. You did a great job with your faux MC! Especially when you're working with committee. Oh, Dear Bill! I'm so sorry you're not feeling well! Take care of yourself. This is a great post! The MC ware is so lovely and fun! I adore those blue/yellow votive candle holders. So sorry you are not feeling well. Hopefully, things will be better soon. Now..are you using PhotoScape? It's free and when you have blurry photos, you can sharpen them up soooo much. You might want to give it a try...don't think I could survive without PhotoScape. Feel better soon, my friend. I love MC! For many years, I have been inspired by many of the designs. The painted glassware sparked my imagination... Thanks to MC, I ended up painting plates and wine glasses for Christmas...and the cake dome with platter (Cloche party photo)when our funds were tight.It's so much fun to do!!! Bill_ It's great. I really an not that familiar with Mackenzie Childs, but it is pretty. Your wine glasses are perfect! I've think I got "it" too--starting feeling awful this afternoon--hope you feel better. I'm off to sleep and hope "it" disappears over night! Hope you feel better! Allergies have been horrible this summer. Hey brother! 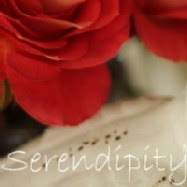 I am sorry you have been under the weather...it's an awful place to be :( I hope you feel much better, soon!! A lot of people are having allergies and such right now!! I like the table, the wine glasses were great!! Hope you feel better soon ... I have seasonal allergies and it hits me like a ton of bricks this time of year. You have my heartfelt sympathy. Feel better soon! I love it when hostesses use the "nice stuff" and not the paper/plastic things! It always makes the occasion feel more special. How fun to see the first 'scape you had a hand it - great job but you've come a long way!!! I hope your illness is short lived & that you'll be feeling better soon. Thanks for telling us a little about your early years in tablescaping. Even back then, one can see you had the touch! I never would have thought to PAINT the glasses so they matched. You've opened up a whole new world of possibilities with that idea. Thanks! Bill, thanks so much for sharing your friend's table. Beautiful inspiration. Those seasonal allergies are no fun!! Feel better soon! Bill, Sorry you are under the weather, my husband is also suffering from allergies, if had to make a trip to the dr. I hope you feel better soon, Bill! I love anything by Mackenzie-Childs. Your wine glasses are so neat! What a great idea to pep up Dollar Tree glasses. I would never have thought to paint the glasses for a one-time use...very clever! They look great. I can say I know how those allergies can hit! Hope you're up and playing with dishes again soon. Love what you've shown us and I too love anything MacKenzie-Childs. What a great idea with the glasses! Great table and what a fun theme! Love the idea of using Dollar tree glasses..they came out fab! Hello, I am new to blogging and like your blog so I decided to follow. I am having those allergy problems also. How creative and fun... get well! I joined you and will put you on my blog roll. I love MC! Can't get enough of their lovely creations! I love MC as everyone else! The glasses turned out great! I love to have a set! When your feeling better! lol Get Well Soon! Okay, I'm not a plate savvy as I thought...I am not familiar with "MC". I have some catching up to do. I'm sorry to hear you're not feeling well Bill. The Tablescape community suffers from your absence. Wishing you a speedy recovery! Cool! Hey, I figured you couldn't keep it all up!! I mean , hey, you have to have time to live! Get well!! Hope you feel better soon. Thanks for sharing the table. I was sorry to hear that you were not feeling well and I hope that you are feeling better. Great table and I like the black and white check. Bill, I hope you feel better soon. I really liked this post because I learned something. I didn't know there were crystal caddies for forks, now I know and now I'll be looking for them. You visited my blog awhile back and I wanted to thank you. I hope you'll visit again, I know I'll be back to visit your blog. I would love to have those checked plates! Perfect. And allergies can be so aggravating. :( Feel better soon. Very beautiful - thankyou ! This was a very enjoyable post! And I'm always amazed at your artistic ability! Beautiful, really. I'm sorry you're not feeling well. 'Hope you're on the mend now. I've been away from blogging and visiting a lot, my daughter was in the hospital with emergency surgery, and my husband was home all week with the flu. Everyone is on the mend now and I'm hoping life goes back to normal (or more normal in my case!). Sorry you're not feeling well, Bill, but glad you were able to post the great "mini"...I loved it! I don't always leave a comment, but I love looking at your wonderful tablescapes, which are always so elegantly presented...I can feel the care you put into each one.